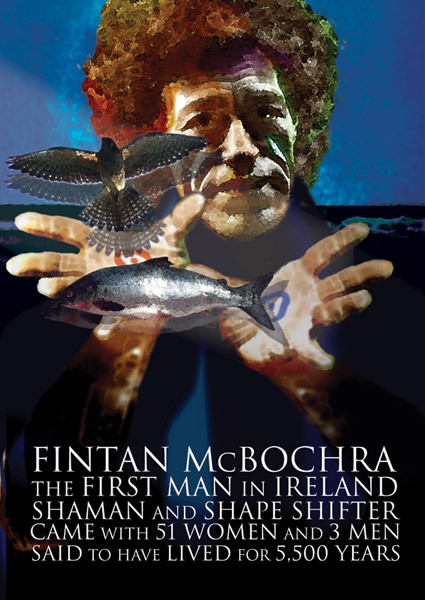 Fintan Mac Bochra, the first man to set foot on Ireland, following his wife, Cesaire, lived a long life; over five thousand years. He changed into all the different animals of Ireland, and witnessed all the changes, all the new peoples who came to Ireland down through the centuries. He saw the defeat of the magical Tuatha de Dannan at the hands of the Sons of Mil, and witnessed the great deeds of the Red Branch and the Fianna. “Well, if it was you who left me one-eyed, you should pay me compensation for its loss, as law and custom demand!” said Fintan. He told the Hawk how he’d lived as a salmon, an eagle, and a blue-eyed falcon before Lugh put him back into his own shape. Then, as a man again, he saw the king of Ireland, Slainge of the Fir Bolg, invent festivals. Fintan sided with the Fir Bolg and their king Eochaid at the First Battle of Moytura, where they fought the Tuatha de Dannan for dominion of Ireland. The Hawk told Fintan all the heroic battles of its youth, and how it had faced down and killed the greatest heroes of the birds: the Crane of Moy Leana, the Eagle of Druim Brice, the two full-fat birds of Leithin, and the Blackfoot of Slieve Fuaid. It reminisced about the days of the Tuatha de Dannan, when it carried home the bodies of champions in its talons to feed its nestlings, and the age of Conn Cead Cathach, when it could lift a fawn, and the time of Cormac Mac Art, when it could carry a piglet. But by the time Niall of the Nine Hostages was king, the Hawk was maddened with its own weakness, and these days, it could barely lift a blackbird. They talked long into the night, Fintan and the Hawk, and they told each other all the stories they could remember, good times and bad. And the next day, they died together.